Lil Nas X's "Old Town Road," a country-inflected rap song celebrating the act of taking your horses down to the "old town road" of the title, is currently the number one song in America. On April 8, Billboard announced that the track had moved from No. 15 on its Hot 100 Chart, where it was the previous week, to the top spot, knocking Ariana Grande's hit "7 Rings" from its perch. Powered by a potent combination of social media excitement, genre-labeling chart controversy, and a remix featuring an assist from the king of the "Achy Breaky Heart" himself, "Old Town Road" has made the precarious leap from viral internet oddity to genuine pop-culture phenomenon. The song's path to ubiquity is not totally without precedent. As Billboard notes, Lil Nas X is the first artist to grab the number one spot with his first Hot 100 charting song since Cardi B's "Bodak Yellow" in October 2017. Like Bauuer's "Harlem Shake," the first track to really benefit from the addition of streaming data to the Billboard chart formula, "Old Town Road" initially caught fire because of a popular video dance trend. It's impossible to know what the future holds for 19-year-old Montero Lamar Hill, who goes by the stage name Lil Nas X, but he's already signed to Columbia Records, met one of his heroes, and his track was streamed 46 million times last week. As the lyrics go, he'll probably ride this until he can't no more. How exactly did "Old Town Road" get so big so fast? From one vantage point, it's a tale as old as time: A Star is Born, but starring a teen in Atlanta with a dream and a SoundCloud account. It's also a complicated story about a tech-savvy, meme-aware artist gaming the complicated modern streaming music ecosystem. Put your horses in the back, slip on a pair of Wranglers, hop on the tractor, and giddy up -- sorry, sorry -- to read more ahead. What is "Old Town Road" and how did it first catch on? One of the first things you'll probably notice about "Old Town Road," besides its earworm hook about horses that's both catchy and funny, is its length. It's less than two minutes long. Right when you start to really enjoy the song, it ends, which leaves you with only one option: Go back to the beginning and listen to it again. The beat itself was created by producer YoungKio, a teenager in the Netherlands who sampled the Nine Inch Nails track "34 Ghosts IV" and offered the track in his beat store. In a recent interview, he described it as a "throwaway beat" and said he didn't know about "Old Town Road" until someone tagged him in a meme on Instagram featuring the finished track in December. Lil Nas X's "Old Town Road" was uploaded to SoundCloud in December, but it really found its footing on Tik Tok, the popular video app that allows users to make short music videos with goofy edits and effects. (In December, Lil Nas X also uploaded his own video for the track to YouTube featuring edited clips of the Western video game Red Dead Redemption 2.) Like the now shuttered app Vine, Tik Tok is especially popular with teenagers. And what do teenagers like? Memes. That becomes clear when you watch any "Yee Haw Challenge" compilation, a popular genre of Tik Tok video that took off in March of 2019. Like many popular memes, the joke is both incredibly simple and borderline unexplainable: an individual is dressed "normally;" said individual discovers and drinks from some quasi-mystical "yee yee juice;" they're transformed into "cowboy" duds. "Old Town Road" plays as this country metamorphosis unfolds before your eyes. Typically, some dancing and mugging for the camera is involved. That's pretty much it, but the premise allows for a near infinite variations on the idea. As the memes intensified, the song spread beyond Tik Tok. By the end of March, the ubiquity of "Old Town Road" was widespread enough that both Justin Bieber and the Texas Tech basketball team, which posted a locker room celebration video set to the song, began to take notice. In April, even Avengers star Mark Ruffalo was getting in on the fun, posting a photo of himself in a cowboy hat and joking about taking his horse "down to old town road." Unquestionably, Lil Nas X had arrived. Who is Lil Nas X? Montero Hill's story is one of hustle and determination. According to an interview with Time, he dropped out of college eight months ago to pursue a career in music. When he wrote "Old Town Road," he was living with his sister and the song grew out of his desire to change the situation. "She was pretty much fed up with me being there," he says in the interview. "That’s where the chorus lyric came from -- it was me saying, 'I want to leave everything behind.'" Since the song blew up, his online history has also come under scrutiny. A story in New York provided a closer look at his time posting under the now-banned Twitter account @NasMaraj, which was known for its "reliance on spammy tactics and copying others." As the article explains in great detail, his old account engaged in a practice known as "tweetdecking" where users attempt to engineer virality by taking material from less popular accounts. At the same time, he was also a member of the Nicki Minaj fan community online and used his account to support her. In the music industry, the line between marketing and spamming people has often been blurry. It's not hard to see how the methods Hill used to game Twitter might also help him as a promoter of his own music, and Hill has acknowledged that in interviews. "I run a meme type of account on Twitter; I know what my audience is looking for," he told Rolling Stone in an interview. "So I put some potentially funny lines in there." Even the tagging of "Old Town Road" as "#country' on SoundCloud can be seen as a clever maneuver to get the song in front of more listeners. The SoundCloud country section is considered less competitive than other genres, allowing "Old Town Road" to rise faster -- and generating some controversy in the process. How did "Old Town Road" become so controversial? "Old Town Road" is obviously not the first song to meld elements of hip-hop and R&B with country music. Lil Nas X has cited Young Thug's work, particularly the country-tinged album Beautiful Thugger Girls, as an inspiration, and many critics have noted Beyoncé's "Daddy Lessons," which was performed at the CMA's in 2016 with the Dixie Chicks, as another recent inflection point. It's been going on forever. Within the world of country music, groups like Florida Georgia Line and artists like Luke Bryan have been adding a healthy portion of hip-hop to their arena-packing country music for years, and rappers have worked country music reference points into their work for decades. On a broader cultural level, "Old Town Road" also arrives at what could arguably be the peak of the "Yee Haw Agenda," a term coined by Bri Malandro to describe the current rise in country-western style. The removal spurred a larger debate about the decision, which led to many writers and music fans criticizing Billboard's problematic history of categorizing music around racial lines. Many other artists came to Lil Nas X's defense, with rapper Ski Mask the Slump God referring to the decision as "discrimination at its finest." The conversation raises a tricky question: What exactly makes a song a "country" song? The only thing that's clear is that the debate -- along with the many articles like the one you're currently reading -- likely helped the song become an even bigger hit. What does Billy Ray Cyrus have to do with all of this? Here's where things get wild. 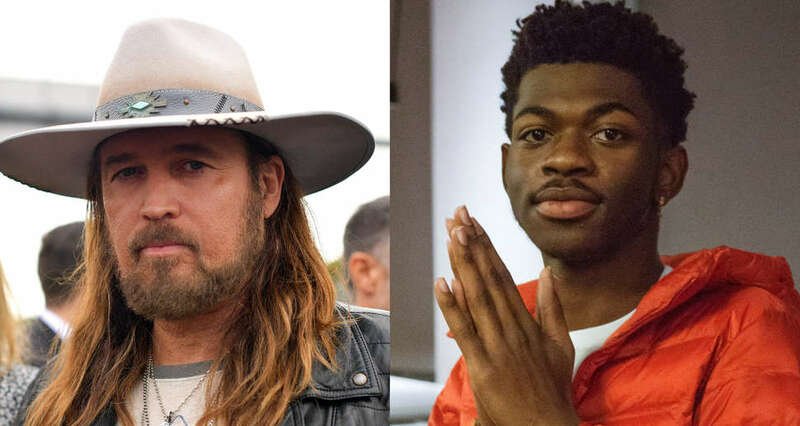 During the initial chart controversy, country singer Billy Ray Cyrus sent a message to Lil Nas X on Twitter. "Been watching everything going on with OTR," he wrote. "When I got thrown off the charts, Waylon Jennings said to me 'Take this as a compliment' means you’re doing something great! Only Outlaws are outlawed. Welcome to the club!" Days later, Lil Nas X and Cyrus released a remix to "Old Town Road" featuring Cyrus, but most importantly, it was really good. Cyrus clearly gets what works about the song and leans into the lightly comedic conceit of the track with a verse about "Fendi sports bras" and driving around in his "Maserati sports car." The remix isn't necessarily better than the original, but it understands the essential appeal of "Old Town Road." What exactly is that appeal? At the risk of stating the obvious, I'll say "Old Town Road" is unapologetic, uncomplicated fun. There's a line about "bull ridin' and boobies" and another about having "Wrangler on my booty." Come on, that's pretty funny. At the same time, there's an emotional core to the song's chorus, a familiar sense of country-western longing that elevates it from being a parody or a joke. The road might be old, but Lil Nas X makes it feel new. Sign up here for our daily Thrillist email, get Streamail for more entertainment, and subscribe here for our YouTube channel to get your fix of the best in food/drink/fun. Dan Jackson is a staff writer at Thrillist Entertainment. He's on Twitter @danielvjackson.